« Who has the most to fear from Palm's "New-ness"? Perhaps taking a leaf out of the BBC iPlayer’s book, Google-owned YouTube have launched a version of the video sharing site designed specifically for viewing on a television. … the TV Website offers a dynamic, lean-back, 10-foot television viewing experience through a streamlined interface that enables you to discover, watch and share YouTube videos on any TV screen with just a few quick clicks of your remote control. 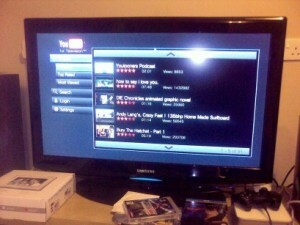 With enlarged text and simplified navigation, it makes watching YouTube on your TV as easy and intuitive as possible. Optional auto-play capability enables users to view related videos sequentially, emulating a traditional television experience. Google also reminds us that, through partnerships with set-top box makers such as Apple, combined with the YouTube API, it’s not the first time that viewers have been able to watch YouTube on the TV, although progress hasn’t been as fast as the company would have liked.